I love combining crafts to create items. 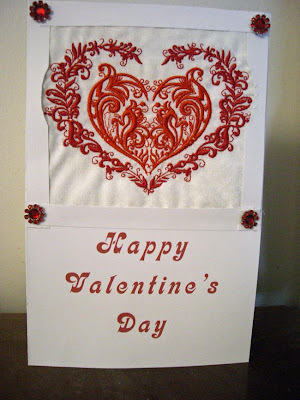 This time it's embroidery and cardmaking. 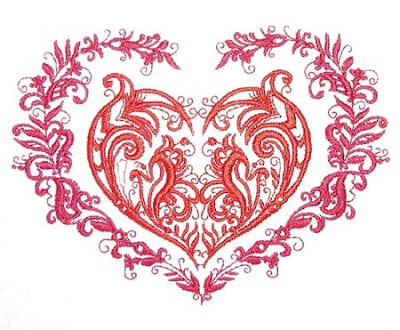 I searched for the perfect heart pattern and found this heart at abc embroidery designs. I knew this was going to be on my card the moment I saw it. I started to stitched it out and ran into my first bobbin thread ending. It made a little mess but I kept on going. It's easy for me to find but the hubby did not find it. I used it in my explanation of why I love and appreciate him so much. He does not see my issues and faults and only sees the big picture. I'm sure my crafty friends can find it. I also used two contrasting reds for a reason to comment on how different we are but complement each other. I then cut it out in a square size a smidgen smaller than my cardstock. Placed double-sided tape on the back and placed it on the top section of my card. 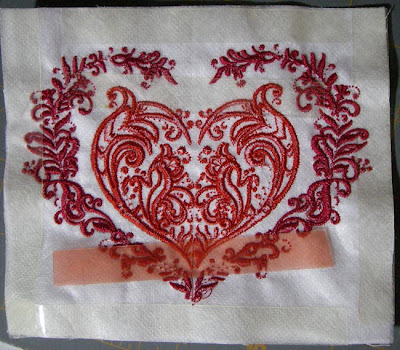 Then I placed half inch strips around the corner to hide the edges and double-taped them down and trimmed around the heart. I finally adhered the corners with rhinestone tacks and there you have it. Hope you enjoy your valentines day! I got a gift card to Joann's so I'm very happy. Thank you Jackie, it's a keeper for us too. I especially liked how the paper trim came out over the fabric edges.